Image via Book of Mormon Central. Researching a topic is infinitely more complicated today than it was before the advent of the internet. Back in the day, if we wanted to look into something, we had to go to libraries and bookstores and actively seek out the “best books”. There were librarians and professors to help know where to look and which sources to trust. Today, we can almost accidently fall into a “research” spiral of blogs and websites and forums on pretty much any subject with absolutely no curation outside of algorithms designed to send us to the most “relevant” sources (“relevant” meaning popular or paid-for). Whether we’re researching for a term paper using Wikipedia or just Googled something to settle an argument with a friend, we are immediately dropped into murky waters, often without fully recognizing it. We’re like fish in the sludge of the internet, just doing our best to swim and breathe, not realizing how harmful our environment can actually be. When the topic we are looking into is one of faith and religion and not “Okay Google, who played that character in that movie”, things become doubly tricky and it’s easy to get lost in that “research” spiral. The sources that can provide us with trustworthy answers about film castings, the tastiest chocolate chip cookie recipe, and the health rating of the nearest Denny’s are not quite as trustworthy when it comes to whether or not you can put your faith in the doctrines professed by any given church. Should what is at the top of that Google or Bing search page hold as much weight as it does? If a blog post dumps a load of troubling information you’ve never heard about in a particular context, is that new information accurate—or better questioned, is it presented accurately and should you take it at face value? If someone says they just want you to have “all the information” so you can “make an informed decision” does that make what they’re saying more helpful or true? And should their stated intentions and information be taken at face-value? 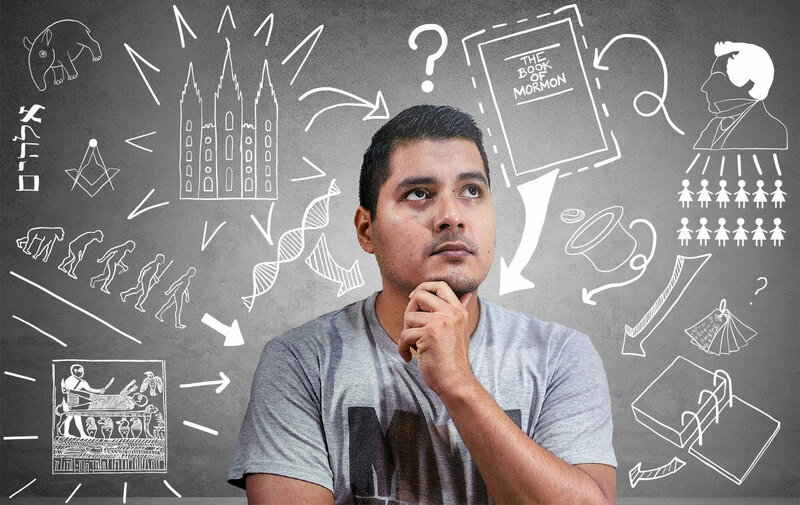 When you come across something that seems in direct opposition to what you’ve always known or thought you knew about the Church of Jesus Christ of Latter-day Saints and the Gospel it offers, how seriously should you take it and what should you do next? Here are seven ways to help you safely navigate the murky waters of religion on the internet. Image by McElspeth via Pixabay. This is about more than knowing their name and their personal journey, this is about credentials. How did they become the experts they’re claiming to be? How do they know what they know? There are going to be an endless number of people who will say you can trust them because you can trust them. That they’ve spent a lot of time researching a topic, but “a lot of time” is not the same as training. And it’s certainly not the same thing as having published in peer-reviewed publications with rigorous research standards. Look for people who have the training to research and synthesize information. And then, on top of training, who is checking their research for accuracy? Which brings us to # 2. Image by TPHeinz via Pixabay. Did you stumble across this new information in a peer reviewed journal article or someone’s personal blog? On a website carefully curated by researchers held to a rigorous standard of academic excellence or a Reddit page? Knowing a person’s credentials is only step one. Step two is to know their research standards. What resources are they using? Is anyone with more authority on the subject checking over their work before they were allowed to publish it? Is there any standard at all that they are being held to? With most blogs and internet forums, the answer to the question of standards is almost certainly no, there are none. This distinction matters more today than ever because we’re drowning in “citizen journalism” and authoritative-sounding blogs and forums. And I say “drowning” not just because there’s a lot of it, but because they’re blocking the air and space required to make truly informed decisions, leaving us gasping for spiritual and intellectual peace. It is not enough for them to just mention or hyperlink to selective resources, they need to be able to give accurate and meaningful context that can be and is held under the microscope of other, more knowledgeable researchers. There has to be a rigorous standard to which they are held accountable in their research and publication methods. Image by Pexels via Pixabay. Motivation matters, a lot. Especially when it comes to writing about a religion. Religion and faith are uniquely difficult to be unbiased about. So, question their motives. Did they write what they did because they’re angry or disaffected? Or because they’ve actually found something interesting and noteworthy? Are they trying to build faith or break it? Those critical of faith and religion will try and tell you that those working to build your faith can’t be trusted because they are only attempting to justify their personal beliefs. The critics sling this illogical mud all the while hypocritically alleviating themselves of the responsibility of their own biases, beliefs, and end goals. Relentlessly question the motivations of those who would lead you to believe that your faith is built on lies. Of course, you should also question those who are building faith through facts, but remember the motivation to build has a goodness to it that the motivation to destroy just never will. Check the sources either way. Don’t just believe what’s being said. Dive into the footnotes with a clear head. Which brings me to the next point. This is an issue of emotion vs. intellectuality and unfortunately (when it comes to our instincts) this is a tough one to crack. Instinctually, as social creatures, we tend to lend a lot of credence to displays of emotion, especially emotion that we can relate to or have sympathy for. The problem with articles or blog posts or comments that bleed with emotion is that they don’t often hold up to scrutiny, but it can be hard to see that through all the feelings. In terms of those critical of the Restored Church, because leaving a faith is a profoundly emotional experience (involving everything from anger to fear to anguish), those stories have a lot of power, especially when they elicit similar emotions in the reader. This becomes particularly problematic when emotion is mixed with research. If someone is talking about how they were struck with fear and anger and devastation as they encountered some piece of research or historical data, that can make what they’re talking about feel more credible or weighty than it actually is. Counter to our instincts, things that are explained with a cool head and factual tone, removed from emotion, are often far more reliable because that tone is part of the academic rigor expected in well-researched publications. It’s also important to note on research presented to defend faith, if it’s presented with a lot of emotion (from excitement to overzealous justification), that too is problematic. Excitedly presenting information as absolutes or justification for faith won’t stand up well to rigorous peer-review either. So, instead, look for research that is measured, careful, and supported by other research, which brings us to our next point. Image by Lubos Houska via Pixabay. Whenever you encounter new research, ask: Can their claims be substantiated through existing academic means? In other words, how would this hold up outside of the pocket of the internet I found it in? You really need to step out of yourself and ask some pretty tough questions until you’ve identified a source as reliable. And by “step out of yourself” I mean, check how you’re feeling and how that’s affecting your judgment. Instead of immediately trusting a source, look at the footnotes (are there any? Are they from respectable sources? Have you looked into them yet?) because those additional resources should help you identify if the research is built on a good foundation and lead you to further understanding on the subject. Of course, it’s good for emerging research to challenge existing ideas, especially in the case of archaeology, which is in a state of continuous expansion, but it needs to do it at the same level as the existing research. So, for the umpteenth time: check the sources! This is a sneaky one. You’re going to run into a LOT of faith-teetering claims about the “truth” behind the Church’s history or Book of Mormon archaeological research. Quite frankly, it’s easy to make history sound crazy, stupid, or sleazy or archaeology sound damningly conclusive because of one important element: context. The problem with things that happened 175 years ago or 2,175 years ago is that we don’t actually know what it was like to be a human, walking around and facing what the world had to offer during those times. We can only look back with the lenses of our time. And 1840 doesn’t always look great with 2019 glasses on, not to mention more recent years like 1939 or 1974 or 1995 (just consider how cringeworthy sitcoms of those eras seem today, let alone what was considered normal or acceptable in everyday life). When faced with seemingly shocking or scary historical topics, remember to ask yourself what was it like to be alive during the specific time, place, and circumstance of the situation you’ve been presented. If you don’t know, look into it, search out first-person resources of people who were actually there and involved. Try to remember that the reason why historical stuff is commonly used to either scare or mock LDS believers is because it’s easily removed from its natural context. This is particularly insidious stuff when you consider the reality that truths out of context, but presented as the entire story are ultimately lies. This brings up an interesting question: what happens when you’ve encountered a criticism or an aspect of Church history that makes it look like you’ve been fed lies in the shape of partial truths? My question for you is this: are you absolutely sure the Church has never or is not currently dealing with those criticisms or histories? Or have you just not heard about it until now? Of course, this is scary territory to enter, anyone who has been there knows so, but I’m asking you to take a moment to step away from yourself and your emotions, and once again check what you’re feeling. Remember that strong emotions, especially fear, can make things seem to be more than what they are. [B]e kind regarding human frailty—your own as well as that of those who serve with you in a Church led by volunteer, mortal men and women. Except in the case of His only perfect Begotten Son, imperfect people are all God has ever had to work with. That must be terribly frustrating to Him, but He deals with it. So should we. In everything to do with history and the context of human existence, sometimes we just need to be patient and remember that every person, including you, is (and was throughout history) a deeply complicated, multi-dimensional human. And just like you would like the full context of your actions to be taken into consideration when you’re being judged, so would anyone else. Critics claim that the Book of Mormon cannot be true because there is no archaeological evidence that certain things mentioned in the Book of Mormon—such as horses, cattle, elephants, silk, and steel—existed in Pre-Columbian America. As with all human endeavors, archaeology requires patience. It is, by nature, an unfolding science. If something hasn’t been “proven” yet by the archaeological record, give it time, maybe it will be in a decade or so (as was the case with cement, barley, and various metals—all things people said that ancient Americans didn’t have and it turns out they did). The important context to keep in mind here is that learning about a people and their culture via archaeology is messy and imperfect and takes years and years, and don’t let anyone tell you otherwise by overgeneralizing findings and taking those findings out of context. At the end of the day, faith and religion are matters of the spirit, not the tangible. You ultimately have to go to the Definitive Source. You have to be willing to humbly submit before God, your Heavenly Father, for the answers to your questions. When problems come and questions arise, do not start your quest for faith by saying how much you do not have, leading as it were with your ‘unbelief.’ … Let me be clear on this point: I am not asking you to pretend to faith you do not have. I am asking you to be true to the faith you do have. To be true to the faith one has requires that that faith be placed in the hands of God, not the sticky hands of the internet. O Little Town of … Jerusalem?